Green Smoothie Popsicles: a great on-the-go breakfast or healthy dessert! After whipping up Cherry Yogurt Popsicles last month, I’ve been pretty obsessed with this homemade popsicles thing. 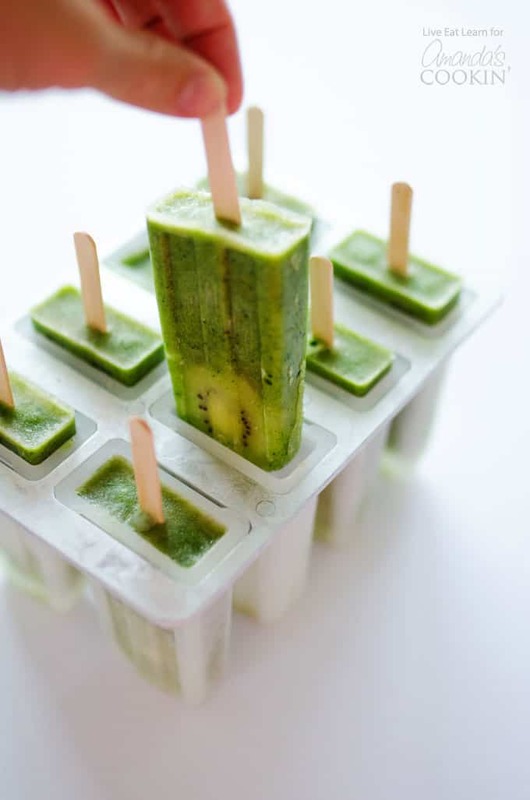 And if you like green smoothies you’re going to love these Green Smoothie Popsicles. Everything I love in liquid form is somehow even better in popsicle form. Like coconut water and pieces of fruit? Heck yes, throw it in a popsicle mold. Fresh orange juice? Oh, yeah. Bourbon slush? I think you know the answer. 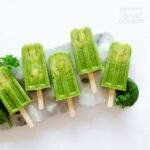 Green smoothies are no exception to this rule, and from which blossomed these beautiful green smoothie popsicles! Unlike some people who make their green smoothies with 100% vegetables, I like my green smoothies to actually taste good. So while there is a hefty handful of spinach in these pops, the majority of the delicious flavor is coming from banana, ginger, and honey. 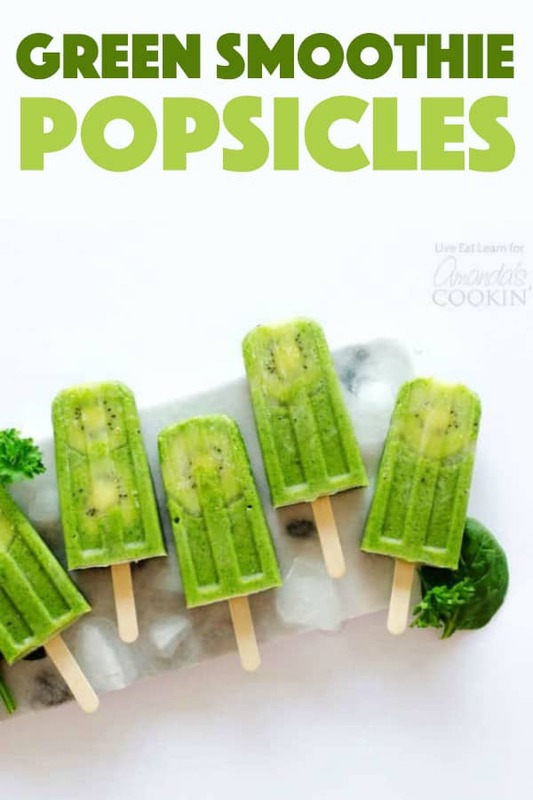 To make these Green Smoothie Popsicles, you’ll essentially blend up the makings for a green smoothie, pour into your popsicle mold, and freeze. 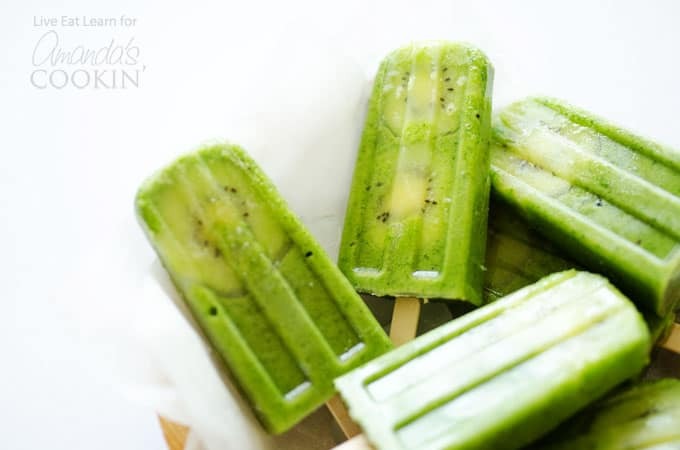 I added a few thin slices of kiwi to each popsicle for decoration, and you could really add whatever colorful fruit you fancy for added pizzaz. 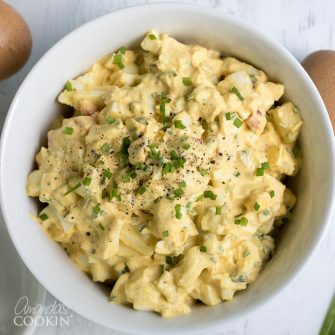 These make a great on-the-go breakfast or just a healthy snack for hot summer days. But whenever you enjoy them, I really think you’re going to love ‘em! We hope you love these Green Smoothie Popsicles! Who knew popsicles could be healthy for you?! Be sure to check out more healthy alternatives below! Blend milk, spinach, and parsley until smooth. Add in the banana, 1 kiwi, honey, and ginger. Blend until smooth then taste, adding more honey if needed. Peel and slice the remaining kiwi, placing a slice or two into each popsicle mold. Remove popsicles from the freezer and run them until warm water for a few seconds to loosen them up. Store leftovers in an airtight container in the freezer. This post was originally published to this blog on Jun 7, 2017.